It's August, the Fringe Festival is in full swing which means the city is full of pop-ups. When it comes to the Festival, I'm all about the street food. I love street food pop-ups during the festival because it's the quickest way to grab a bite before a show in the evening. 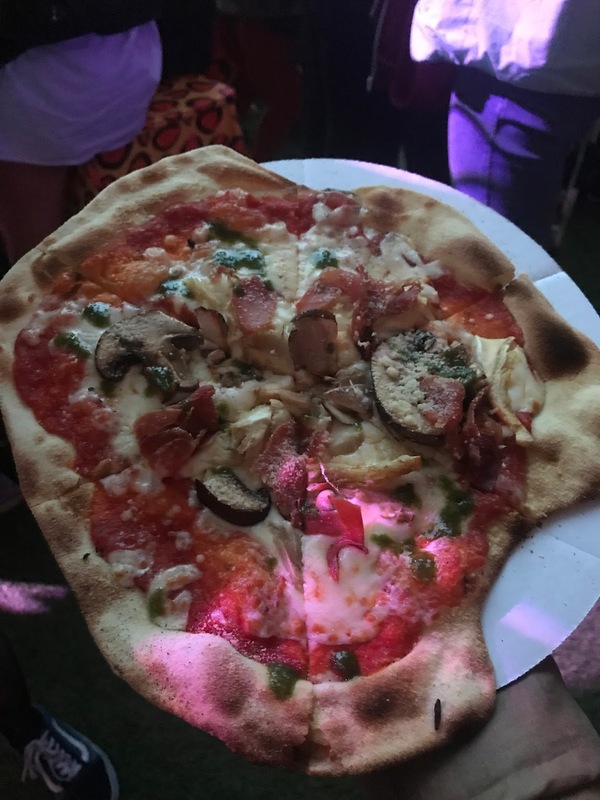 Check out my guide to my favourite street food that have popped up this Festival season. I'm starting off with the George Square area as it is is my go-to for street food every year. And this year they've really outdone themselves. This area is the heart of the Festival action and really does have food for almost anyone. 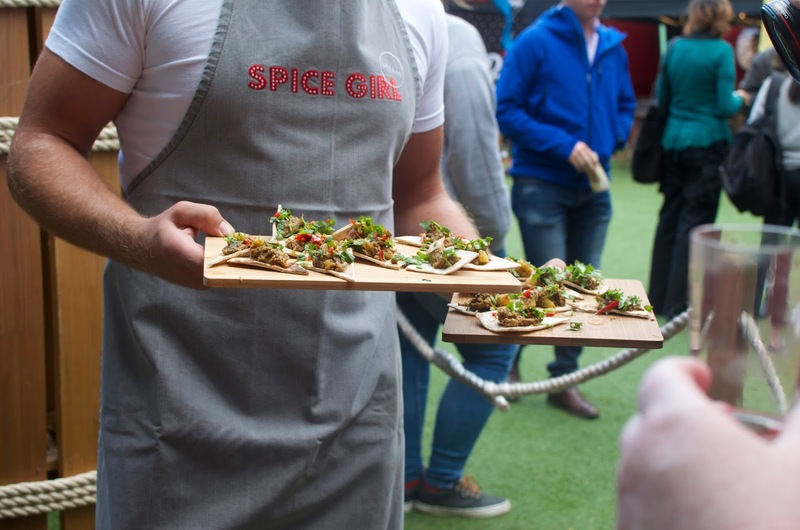 Unami Spice Girl and Spice Boy – With not one but two stalls at this year's festival, Unami Spice Girl and Spice Boy are where you'll find street food with a kick. At Spice Girl you'll find classics like Quesadillas and Nachos to something a little different like Malaysian Rendang. I haven't yet had the chance to properly visit them this year, but have at past food festivals and love their Chicken Satay Skewers. Spice Boy is a new addition serving up jerk chicken, beef or halloumi served in buns, wraps or even on fries. Spice Girl is located outside of Assembly Festival, and Spice Boy is round the corner towards Underbelly. Alanda's – You'll find Alanda's all over the festival this year and they are an absolute classic for a cheeky pre-show chippy. But it's not all just battered cod, they also serve up a variety of sea food. Alanda's is located just outside the Assembly Festival but they also have a Sea Food Grill on George Street this year. To top it all off, Alanda's has an excellent Gelateria inside the Assembly Festival serving up delicious gelato... if the weather is ever going to be warm enough for it. Also outside the Assembly you'll find Cargo Burger and Spud (which sells poutine but it's not amazing and not real poutine because it's just cheese, not cheese curds), the Crepe and Waffle House, the best named coffee stand there ever was Covfefe, and a few others. Chick + Pea – Halloumi lovers rejoice, Chick + Pea have a stall set up in the Assembly Festival. If you haven't tried their halloumi fries you are sorely missing out. They also sell really great falafel and I'm super keen to try out their hummus. Did you really go to the Fringe if you didn't take a picture with the purple cow at Underbelly? At least while you're there check out these great food stands in and outside Underbelly at George Square. The Mac Shack – The Mac Shack is comfort food at its finest. On a classic Scottish rainy day there's nothing better. 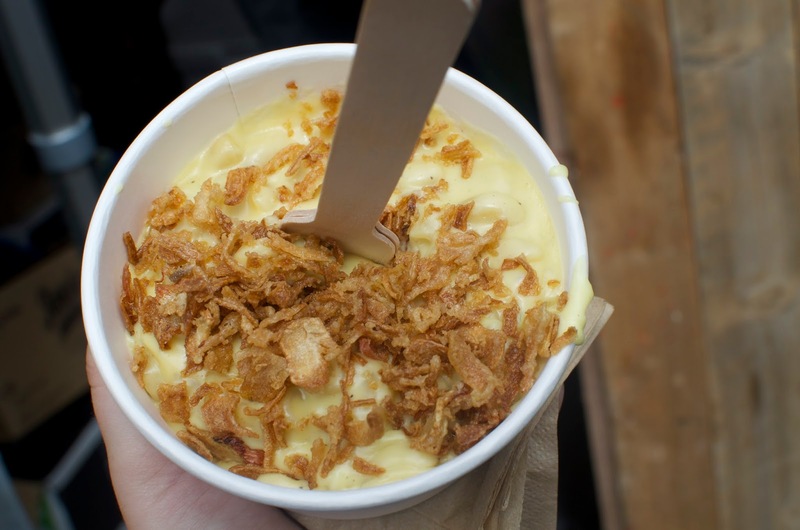 The Mac Shack's mac and cheese comes with a variety of toppings, with even the classic being topped with crunchy onions. The mac and cheese itself has a great little mustardy, tangy taste to it. Definitely a solid choice if you're fending off a multiple-festival-night-bender-hangover. Mimi's Cake Cabin – Always a great spot for those that like a sweet treat. Mimi's cake cabin serves up a selection of their usual offering including traybakes, brownies and cupcakes. Alongside this they serve Luca's ice cream and you can even combine the two into amazing Cake Sundaes! Within Underbelly you'll find Pizza Geeks (also found in their usual spot in Malones on the Mall), Shrimpwreck, Babu Bombay Kitchen and a few other food stands. I've yet to try these but have seen some pictures on Instagram so not going to lie I'm keen to soon, so keep an eye out on my Instagram. There isn't much inside the Gilded Balloon this year except for bars and a burger and pizza stand. But don't worry there's some really great ones just outside. The Cheesy Toast Shack – I think this has to be my favourite food stand at the Fringe this year, if you know my love of cheese you'll understand why. These are super indulgent toasties in an array of meaty or veggie options. 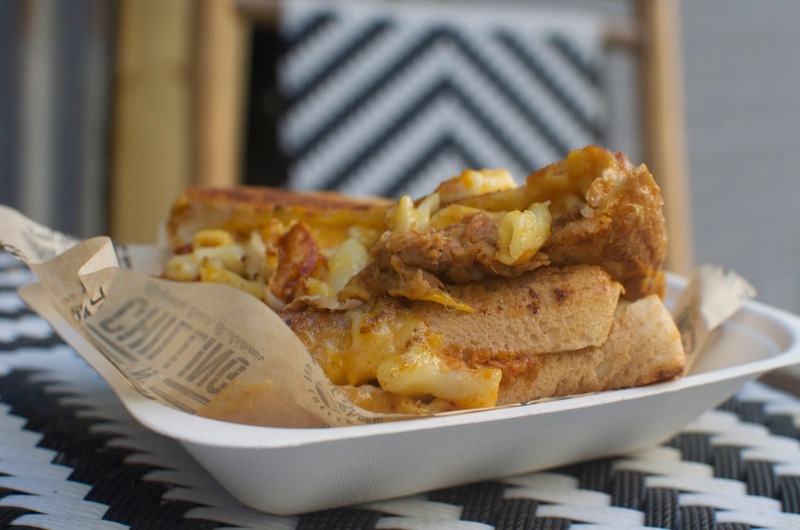 The mac and cheese toastie is the ultimate cheat day food, carbs on carbs on cheese. How could you top that? How about add some pulled pork on there (this wasn't on their official menu, but they're happy to do it for you). They use a variety of different cheese and toppings, I can't wait to head back and try the camembert and mushroom one. You'll find the Cheesy Toasty Shack just outside the Gilded Balloon, I repeated OUTSIDE THE GILDED BALLOON! It is not the one in the Assembly, don't bother with that one. 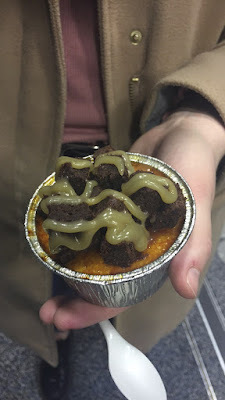 The Crema Caravan – What's better than creme brulee? Creme brulee covered in more goodies of course! 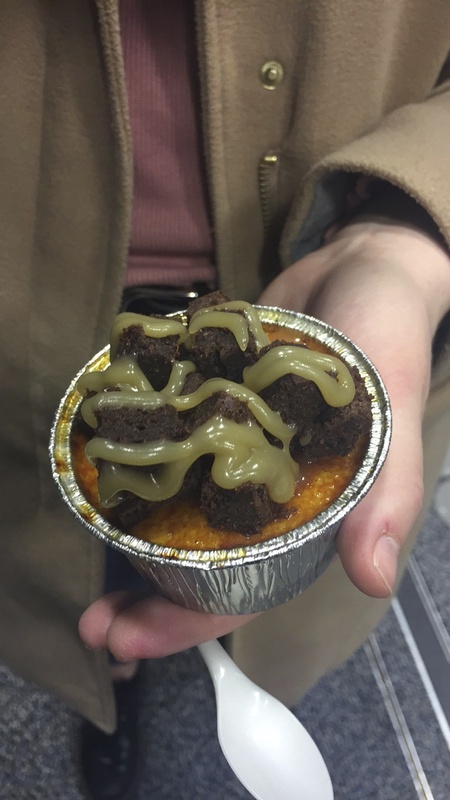 Crema Caravan serve up delicious creme brulees with amazing toppings from brownies to strawberries, adding that extra indulgence to your dessert. I for one think they are far superior to the next door Krispy Kreme hut, but hey each to their own! 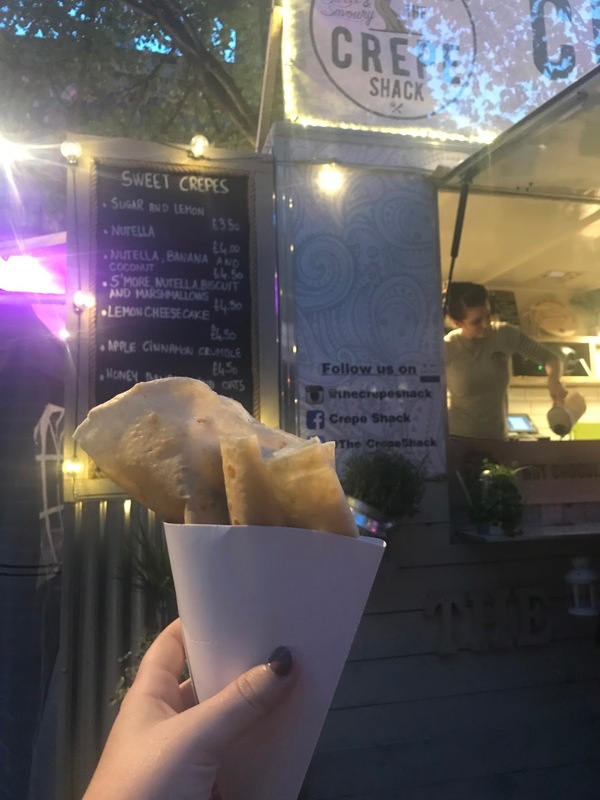 The Crepe Shack – I'm a big fan of the Crepe Shack despite being quite critical of crepes (sorry but I grew up in France I can't help it!). There are a few stands across the festival offering crepes, but this one is my favourite because they push the boat out a bit further with their toppings. Don't worry, the staples (aka Nutella) are still there but they also offer fun things like s'mores crepes. They also do savoury crepes (which I love) with really unique toppings like camembert, pastrami and caramelised onions! The Edinburgh Cocktail Festival has joined forces with the Food and Flea Market and can be found just off the Royal Mile. The perfect place for drinks alongside a bite to eat. The drinks here are definitely a bit pricey for what you get but something a little different from the usual pints. Yes, I did buy the Pina Colada in the pineapple for £9, I'm a sucker for gimmicks. The Food and Flea Market has some great food there including barnacles&bones, Knights Kitchen, Röst and others. Barnacles&bones is one of my favourites, their crab in homemade lemon mayo on chips is insanely good. On my most recent visit, I stopped by the new Moopie Gelato stand for an amazing gelato sandwich (it was sandwiched between chocolate and peanut cookies... just saying). Surely there can't be more? But there actually is! Alongside Alanda's Sea Food Grill on George street you'll find Harajuku Kitchen's famous gyoza a staple in the Edinburgh street food scene. This year at the Pleasance there's more street food than before, including some really good tacos. Round the side of Bedlam Theatre you'll find something a little different... soda floats! 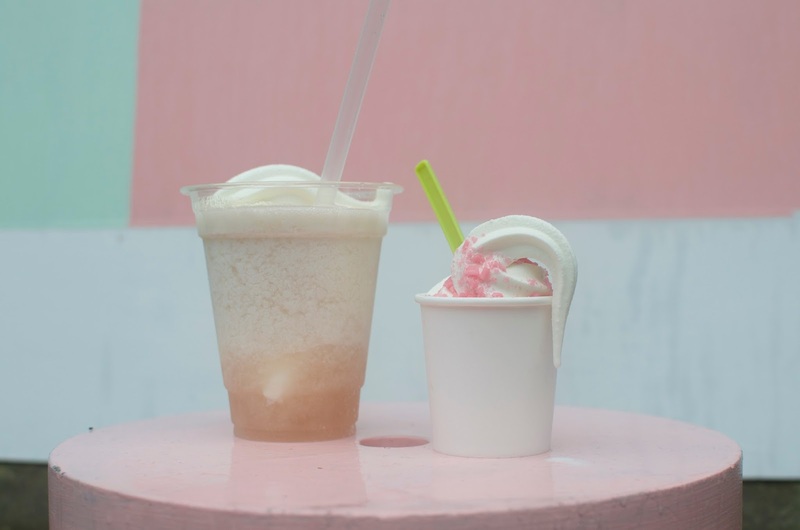 Kitsch Soda have a pop-up serving up their unique craft sodas (including Peach and Thyme) into floats with soft serve from Mossgiel Family Farm. A nice change if you want a pre-show drink but don't want alcohol. Is there anything I've missed out or should get trying now? (Surely not...) Do let me know in the comments below!